Two generals, one in the U.S. Marine Corps and the other in the Army, were embroiled in a controversy that began during the effort to capture Saipan. The ferocious battle for the island of Saipan in the Marianas was won by U.S. Marines and U.S. Army troops that defeated the Japanese during 39 days of heavy fighting from June 15 through July 9, 1944. The death struggle for Saipan was followed by another ferocious battle between the Army and the Marine Corps when the top Marine general on the island, Lt. Gen. Holland M. Smith, relieved the top Army general, Maj. Gen. Ralph Smith, of his job as commanding officer of the 27th Infantry Division. Holland Smith fired Ralph Smith in the middle of the fighting. The abrupt dismissal set off fireworks at flag rank and in the media while generating a controversy that persists to this day. At the center of the dispute was Ralph Smith, who led the 27th Infantry, a New York National Guard outfit, with many of its men drawn from the state’s farming and mountain country along with others from New York City’s tough neighborhoods. Ironically, Ralph Smith was not a New Yorker. He was born in Omaha, Nebraska, in 1893, and attended Colorado State College. He enlisted in the Colorado National Guard in 1916, was commissioned second lieutenant, and was promoted straightaway to first lieutenant. Taught to fly by Orville Wright, Ralph Smith gained the 13th pilot’s license in the history of the United States, signed by Wright himself. Ralph Smith graduated from Officers Training School at Fort Leavenworth, Kansas, in 1917, and served on the Mexican border with the 35th Infantry Regiment. He was sent to France with the 16th Infantry Regiment, part of the 1st Brigade, 4th Infantry Division. He saw a lot of action, including the Meuse-Argonne Offensive, earning a Purple Heart and a Silver Star with Oak Leaf Cluster. On returning home, Ralph Smith served in the usual peacetime Army roles including adjutant of the 2nd Infantry Brigade in Kentucky, French instructor at West Point, training and instructing at the Infantry School, and attending the Command and General Staff School at Fort Leavenworth in 1927-1928. Next up was a tour at the Presidio in San Francisco, then a return to the Command and General Staff School as an instructor. He graduated from the U.S. Army War College in 1935, and was then chosen to study at the prestigious École de Guerre in France. In 1937, Ralph Smith returned to the United States. He was promoted to colonel in 1938, serving as Chief of the Operations Branch, Military Intelligence Division of the War Department General Staff. By 1940, he was Chief of the Plans and Training Branch of the G-2 Division. The following year, Ralph Smith received his brigadier general’s star. All who knew him regarded Ralph Smith as gentle man and a gentleman. 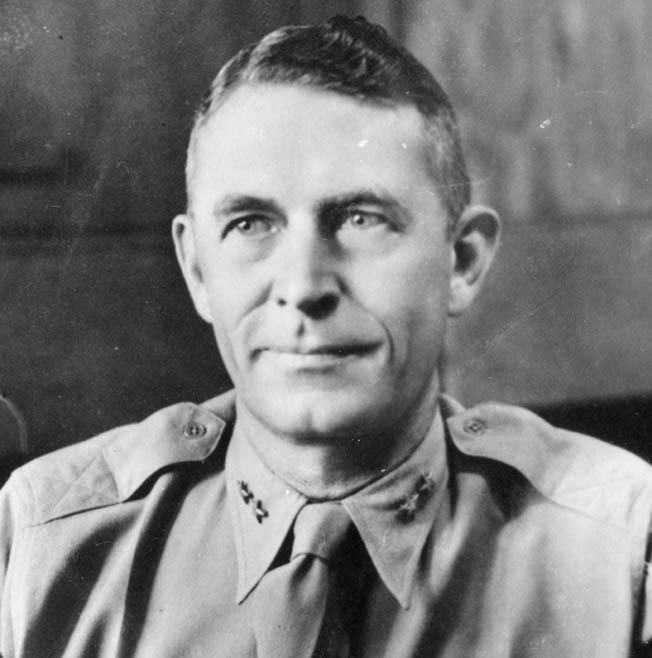 General Holland M. “Howlin’ Mad” Smith of the U.S. Marine Corps relieved General Ralph Smith of the U.S. Army on Saipan and created a firestorm of controversy. In early 1942, the 27th Infantry Division was moved from New York to Hawaii to defend the islands against Japanese attack. The 27th had a proud tradition—one of its units was the 165th Infantry Regiment, which in its World War I incarnation had been the legendary “Fighting 69th” Infantry Regiment commanded by “Wild Bill” Donovan in the Argonne. Ralph Smith was given command of this division. Ralph Smith’s chief antagonist was a ferocious Alabaman, born in 1882. Holland McTyeire “Howlin’ Mad” Smith was the son of a prominent Alabama politician. While attending the Alabama Polytechnic Institute, a military school in Auburn, Holland Smith read about Napoleon and decided to become a career officer. He graduated from the Alabama Polytechnic Institute and then went to law school at the University of Alabama, where he was a better sprinter than scholar but still gained a law degree and was admitted to the bar. When Holland Smith sought an Army commission, he went to Washington to plead his case to his congressman, but the Army turned him down. Some historians suggest that may have given him a lifelong dislike of the Army. A congressman then suggested Holland Smith try his luck with the Marines. “What are the Marines?” Holland Smith asked in all candor, and he found out on March 29, 1905, when he was commissioned as a second lieutenant in the Corps. He was soon nicknamed “Howlin’ Mad,” a play on his name and initials, and went to France with the 8th Marine Regiment in 1917. He earned a Croix de Guerre with Palm in combat. Between the wars, he became one of the Marines’ pioneers of amphibious warfare. In March 1937, Colonel Holland Smith became director of operations and training at Marine Headquarters in Washington, D.C. In September 1939, he gained general’s stars and command of the 1st Marine Brigade. This was doubled in size under his leadership and became the 1st Marine Division. In June 1941, Holland Smith took command of the Amphibious Force, Atlantic Fleet. A short, heavy-set man with a moustache, round, thin glasses, a hard face, and cigar, Holland Smith resembled an elderly business tycoon, not a poster general. Aged 60, his appearance and girth troubled a medical board, which found him physically unfit for combat service due to a diagnosis of severe diabetes. The diagnosis proved to be a mistake, and Holland Smith headed to the West Coast to lead amphibious training as the Marines prepared for Guadalcanal. There, Holland Smith trained Leathernecks for their impending ordeal and Army troops for the Aleutian campaign. While his duties were vital, Smith, like most line officers, fretted about not getting into combat and beseeched Admiral Chester Nimitz, Commander-in-Chief of the Pacific Fleet, for a battle role. Nimitz gave Holland Smith the post of Commanding General, Fleet Marine Force Pacific, and Holland Smith took up his duties on September 5, 1943. Holland Smith headed the invasion of Tarawa in the Gilberts and its nearby islands of Makin and Abemama in November 1943, and under his command was Ralph Smith’s 27th Infantry Division. The two Smiths first clashed during the assault on Makin. After being relieved of command of the 27th Infantry Division, General Ralph Smith and other senior Army officers engaged in a bitter war of words with General Holland M. Smith and the U.S. Marine command establishment. On November 20, the 27th Division’s 165th Infantry Regiment, under Colonel Gardiner Conroy, assaulted Makin and faced fierce defenders. On D+2, Holland Smith went ashore to check on the battle. He found the corpse of Colonel Conroy lying in an open area. Conroy, walking erect on the beach on D-day, had been shot between the eyes by a Japanese sniper, and the body had not been retrieved. Meanwhile, the Marine landings on Tarawa were more successful despite suffering heavy casualties, burnishing the tactics and reputation of the Leathernecks and their tough-talking commander. The Smiths were united again for an amphibious assault on Eniwetok in February 1944, and once again Holland Smith was unhappy with Ralph Smith’s performance. On March 15, 1944, Holland Smith became the Marine Corps’s second three-star general with command of the V Amphibious Corps. With great reluctance, he accepted the 27th Infantry into his command for the invasion of Saipan. When the 27th Infantry came ashore on Saipan, the actual landing was close to farce. The GIs landed by night, their landing craft moving through waters jammed with Navy vessels. Holland Smith’s corps staff did not tell the Navy that the Army was coming ashore. Communications broke down, and Navy officers yelled through loud-hailers at the Army officers demanding to know who these people were and where they were going while point machine guns at them. The infantry officers had to wheedle and beg to get their men ashore. Once aground, the men of the 165th Infantry Regiment were exhausted and seasick before they even met the Japanese. The 105th Infantry Regiment lacked its vehicles, rations, and ammunition. But Ralph Smith did his best, getting the 27th off the beach and into battle, headed for Mount Topotchau. A former Fort Benning infantry instructor, Ralph Smith used the tried-and-true Benning methods to approach the mountain: probe until enemy strongpoints were unmasked, hit them with accurate artillery fire, and use patrols to find ways to outflank the main positions. Frontal assaults up valleys were only acceptable in an emergency. Ralph Smith’s methodical probing irritated Holland Smith, who favored the aggressive violence and direct action that was the Marine hallmark. Personalities as well as tactical methods were now clashing on the rocky island. The Army made little progress. On June 24, after consulting with his superiors, Vice Admiral Richmond Kelly Turner and Vice Admiral Raymond Spruance, Holland Smith relieved Ralph Smith, sending a captain from the Adjutant General’s Corps with the official order, typed up on V Amphibious Corps stationery, and the additional proviso that Ralph Smith and a single aide must leave Saipan by dawn on the 25th. Maj. Gen. Sanderford Jarman, who was to command the Army base on Saipan once the island was secure, would take over the 27th Infantry Division. Ralph Smith offered to stay to help with the transition, but that offer was refused. At 5:17 am on June 25, Ralph Smith and his aide boarded a Navy patrol plane and started winging back to Eniwetok, a 10-hour flight, ultimately headed for Hawaii. 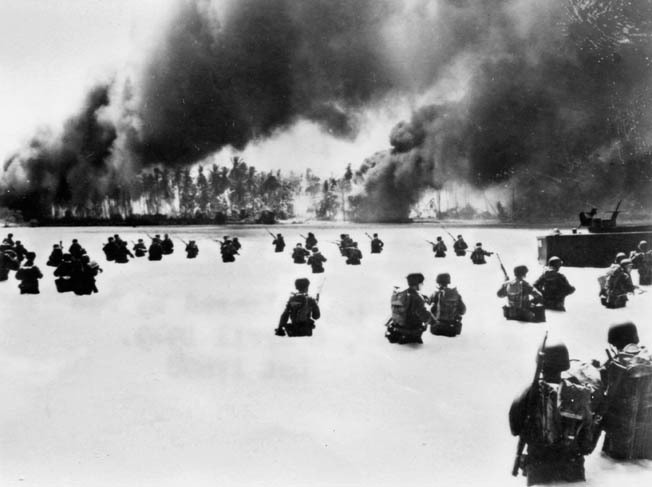 Soldiers of the U.S. Army’s 2nd Battalion, 165th Infantry Regiment, 27th Infantry Division wade ashore on Makin Atoll in the Gilbert Islands in November 1943. Holland Smith was right about the oncoming storm. When Ralph Smith arrived in Hawaii, he reported to Lt. Gen. Robert C. Richardson, the senior Army commander in the Pacific, and Richardson was outraged. He told Ralph Smith to take as much time as necessary to prepare a report on everything that had happened on Saipan. On July 11, Ralph Smith produced a 34-page document with annexes and copies of his communications with Holland Smith. A copy went to Nimitz. Meanwhile, Richardson ordered Lt. Gen. Simon B. Buckner, son of a Confederate Civil War hero and victor of the Aleutian Campaign, to head a five-general board to examine the circumstances of Ralph Smith’s relief. 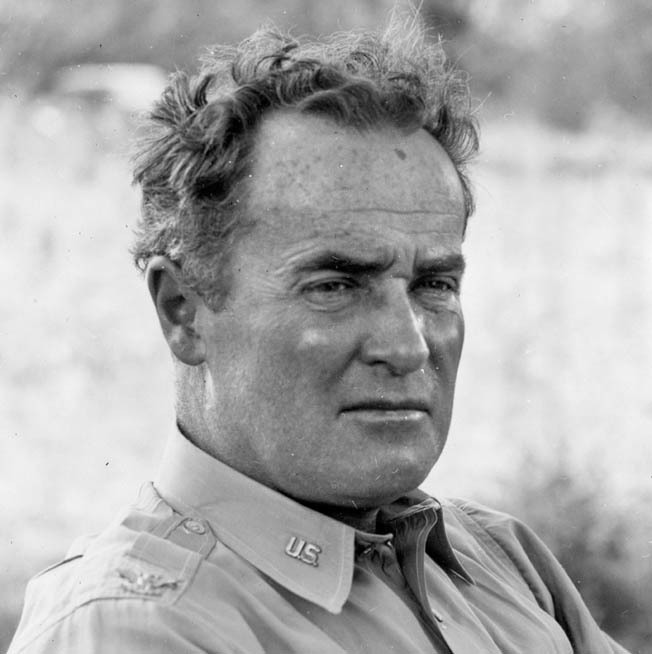 While the gravelly Buckner and his board studied the files, Richardson flew to Saipan in his capacity as commander of all U.S. Army forces in the Pacific Ocean Areas. First he bucked up the 27th Division’s morale by staging a review and presenting decorations for valor—without the knowledge or consent of Holland Smith, who was angry at this breach of military etiquette and infringement on his authority as Corps commander. Faced with this verbal barrage, the normally volatile Holland Smith held his temper, but after the conversation he stormed off to Turner’s flagship and vented his frustration. Colonel Gardiner Conroy, commander of the 165th Infantry Regiment at Makin, was killed in action during the early fighting. 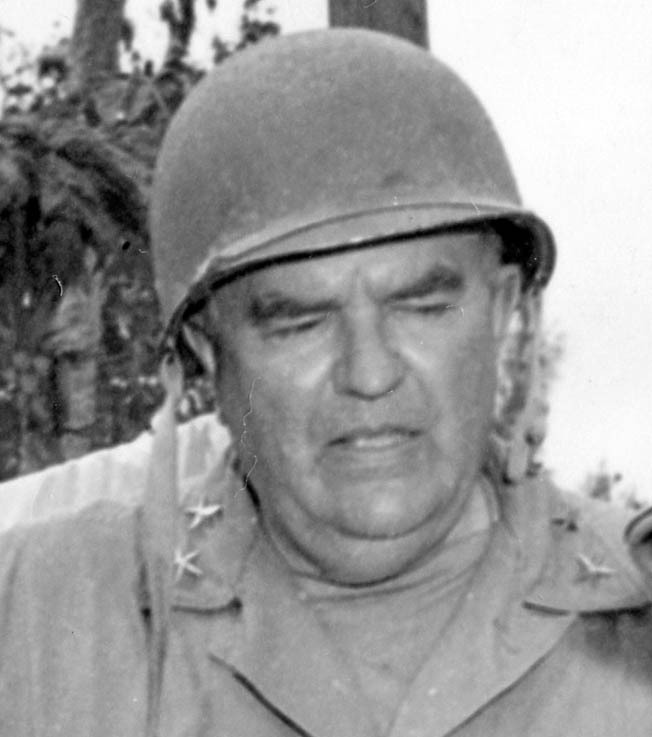 Turner did the next round of exploding, questioning Richardson’s right to exercise any command functions in the battle area and even to visit Saipan. Richardson coolly said that he had permission from Nimitz to visit Saipan, and Turner angrily demanded the proof. Richardson went over Turner’s head to Spruance, who gave Richardson a “what do you expect from Turner” shrug. Spruance and Turner complained to Nimitz about Richardson’s visit and verbal attack on Holland Smith. (1) Holland Smith had full authority to relieve Ralph Smith. (2) The orders effecting the change of command were properly issued. (3) Holland Smith “was not fully informed regarding conditions in the zone of the 27th Infantry Division” when he asked for Ralph Smith’s relief. The board faulted the V Amphibious Corps command for not realizing that the 27th Division was facing much tougher opposition than the Corps anticipated, and the division’s lack of aggressiveness was due to Japanese defenses, not sluggish Army leadership. The Buckner Board noted that the Marine Corps headquarters team and staff work were enormously sloppy and asserted that the senior Marine leadership had not been anywhere near the 27th Division’s sector and simply did not know what the Army had been up against on Mount Tapotchau. The Army had a point. 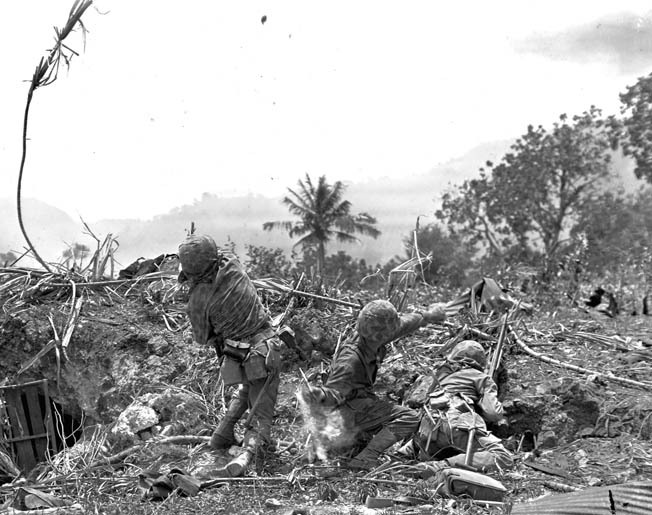 Saipan was the first time in its 150-year history that the U.S. Marine Corps had fought a corps-level action, and while the Leathernecks were fierce fighters and professional warriors they simply lacked the experience needed at that level of combat operations. His bayonet fixed to his M1 Garand rifle, a soldier of the 27th Infantry Division peers from cover on the island of Saipan. The Buckner Board findings went next to Washington for review by Marshall and his Assistant Chief of Staff, Maj. Gen. Thomas T. Handy. They believed that while Holland Smith had some cause to complain about the 27th Division’s lack of aggressiveness, “Holland Smith’s fitness for this command is open to question” because of his deep-seated prejudice against the Army and that “bad blood had developed between the Marines and the Army on Saipan” to such a degree that it endangered future operations in the theater. The Deputy Chief of Staff, Lt. Gen. Joseph T. McNarney, examined the Buckner Board report and concluded that Holland Smith’s V Amphibious Corps staff work was below acceptable standards; there was reasonably good tactical direction on the part of Ralph Smith, but the division had poor leadership among its regimental and battalion commanders, a hesitance to bypass snipers “with a tendency to alibi because of lack of reserves to mop up,” poor march discipline, and lack of reconnaissance. Marshall urged that he and King send identical telegrams to Richardson and Nimitz to “take suitable steps to promptly eradicate any tendency toward … disharmony among the components of our forces.” He also suggested another investigation into the Saipan affair to prevent its recurrence. General Sanford Jarman was placed in command of the 27th Infantry Division after Ralph Smith was fired. Jarman found it difficult to work with senior Marine commanders, just as Ralph Smith had. King wrote back to say that the Buckner Board findings were unilateral and suspect, contained intemperate attacks on the personal character and professional competence of Holland Smith, and he could not concur in any further investigations in which Richardson was a party because that officer had done enough damage by his “investigational activities during his visit to Saipan” and by convening the Buckner Board. That ended any further official action on the controversy. Unfortunately, now the controversy moved into the public arena. The Saipan battle was huge news in the United States, particularly the ghastly Japanese mass suicides on Marpi Point, which had been well-documented by film, photograph, and reporter accounts. The American public was shocked by how the island’s Japanese civilians chose suicide over surrender and the heavy U.S. casualty toll. The command controversy was raw meat for American press barons. William Randolph Hearst’s empire opened the ink barrage. The aging reactionary titan was a major public supporter of the flamboyant and dramatic General Douglas MacArthur, who commanded the Southwest Pacific Theater. Hearst took advantage of Saipan’s high casualty lists and Ralph Smith’s firing to denounce the Navy, Marine Corps, and their leadership. In his flagship newspaper, the San Francisco Examiner, Hearst editorialized that Army commanders used subtle, intelligent tactics while the Marines were one dimensional. “Allegedly excessive loss of life attributed to Marine Corps impetuosity of attack has brought a break between Marine and Army commanders in the Pacific,” Hearst wrote. Hearst had a simple solution to the controversy. Put Douglas MacArthur in supreme command of the entire Pacific Theater from the Aleutians to New Guinea. Putting MacArthur in command of everything was Hearst’s answer to most controversies—in 1948 and 1952 he would back the general for the presidency—but it fueled increasing debate. The Navy had its partisans in the press war, however. Most notable of these was Charles Henry Luce, the publisher of Time and Life magazines. Luce’s admiration dated back to his youth as the child of American missionaries in China at the beginning of the 20th century. There, the Navy and Marines had burnished their reputation by protecting American commercial interests and citizens from the ravages of Chinese bandits, civil war, and later the Sino-Japanese conflict. From the cover of a shell hole, U.S. Marines throw grenades across the shattered landscape of Saipan toward Japanese positions. The stubborn Japanese defense of Saipan resulted in a bloody 39-day campaign to capture the island, and the differing combat doctrines of Marine and Army troops compounded the discord among the highest echelons of the American command. Luce also had a reporter assigned to Holland Smith. Robert Sherrod was close to the fiery Marine general and went ashore with the Marines on the first day of the Saipan invasion, staying with them through the entire grim battle. Sherrod wrote highly accurate stories about Leatherneck courage and enthusiasm. Certainly the Marines had fought well and victoriously, and they made good copy. But Sherrod never visited the Army units, and he overplayed the Marines’ disgust at the 27th Division’s perceived failures. He wrote that while the Marines made great gains against tough Japanese resistance, entire Army battalions were pinned down for hours by a single Japanese gun position or sniper. 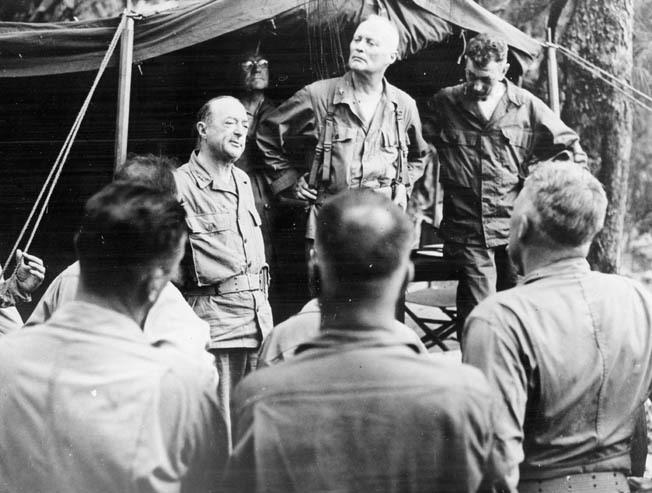 General Robert Richardson, senior commander of U.S. Army troops in the Pacific Theater, addresses staff officers of the 27th Infantry Division during his visit to Saipan after the relief of General Ralph Smith from command. Richardson did not consult Marine General Smith prior to visiting Saipan, and the Marine command establishment considered Richardson’s tour of the island a serious breach of military protocol. Historian Geoffrey Perret wrote decades later that the humiliating article devastated the men of the 27th, and the division never recovered its toughness from the journalistic blow. The debate raged on in the media and in public conversation, which annoyed Marshall, King, and General Henry “Hap” Arnold, head of the U.S. Army Air Forces, who were now wishing the entire affair would simply go away. They were more concerned with the next campaigns, in the Palau Islands, New Guinea, and the Philippines, than in refereeing the “War Between the Smiths.” It was time to end the whole affair. Ralph Smith was given Maj. Gen. George Griner’s old command in Hawaii, the 98th Infantry Division, when Griner took over the 27th. This switch of division commanders was only temporary, though, as Marshall wanted the two Smiths separated for life. Three soldiers of the 27th Infantry Division take temporary cover from Japanese fire on Saipan. Their vantage point is a rock wall on high ground that overlooks cane fields. The terrain on Saipan contributed to the deliberate progress of the Army troops on the island. Ultimately, Ralph Smith’s fluent knowledge of French saved his career. He was assigned as military attaché to General Charles de Gaulle’s Free French government, which had installed itself in Paris. Ralph Smith arrived just in time for the closing guns of the Battle of the Bulge and the opening guns of Operation Nordwind, Hitler’s offensive in Alsace against the U.S. Seventh and French First Armies. The two-pronged German drive was threatening to cut off Strasbourg, and the Americans wanted to withdraw from the city. Unfortunately, Strasbourg’s possession was a major issue for de Gaulle. He was determined not to yield once more a city that had been annexed to Germany in 1870 to the Huns. General Dwight D. Eisenhower, Supreme Commander Allied Expeditionary Force, threatened to cut off supplies to de Gaulle’s troops if they did not withdraw. De Gaulle was obstinate. With the two Allies shouting at each other, quiet diplomacy was needed to resolve the situation, and Ralph Smith provided it. He convinced the French that American and French troops would fight to hold the city. Both Strasbourg and French honor were saved, a good deal of it through Ralph Smith’s efforts. Holland Smith got a different reward. With six Marine divisions in the Pacific now, along with 28 artillery battalions, 12 Amtrac battalions, and four Marine air wings, the Marines now had an army rather than a corps in the field and needed a Marine headquarters to administer this force. Holland Smith was named head of Fleet Marine Force, Pacific, which was a mixed blessing for the fiery warrior. 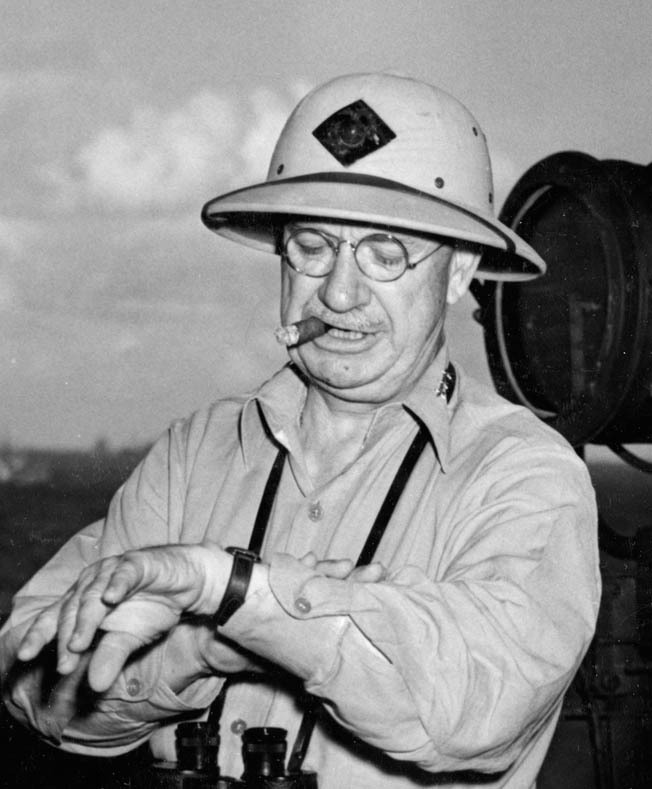 While he oversaw the entire Marine war effort in the Pacific, he did not actually command Leathernecks in battle. Nor did he command Army troops again. The invasion of Iwo Jima was purely a Navy-Marine show, and both services suffered heavy casualties while gaining the island and glory, but when the Marines were assigned for the invasions of Okinawa and Kyushu they came under Army command. At Okinawa, the higher formation was the U.S. Tenth Army under General Buckner. Ironically, Buckner was killed late in the battle, and Marine Lt. Gen. Roy Geiger, who commanded the III Amphibious Corps, took temporary charge of the Tenth Army from June 18 to June 23 while General Joseph Stilwell flew in from the United States to assume command. Geiger thus became the only Marine officer to command a U.S. Army in the field. 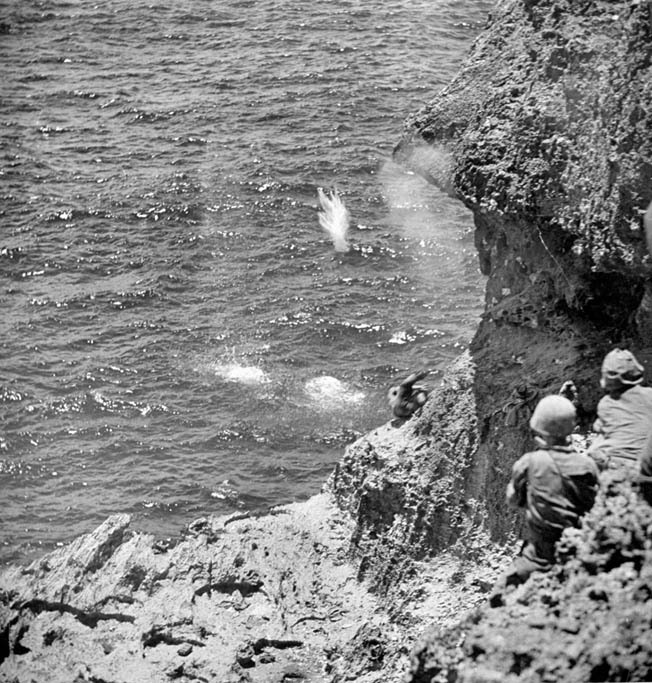 Believing horrific tales of American atrocities fabricated by Japanese military propagandists, Japanese civilians commit suicide by flinging themselves and their children from the cliffs at Marpi Point on the island of Saipan. Unable to intervene, U.S. Marines watch helplessly as the civilians end their lives by drowning or falling on the rocks below. In the planning for Operation Olympic, the invasion of Kyushu, and Operation Coronet, the invasion of Honshu, the Marines were to come under the U.S. Sixth Army and General Walter Krueger in Olympic and General Robert Eichelberger’s U.S. Eighth Army in Coronet. Both invasions were forestalled by the atomic bombings of Hiroshima and Nagasaki, which hastened Japan’s surrender. But the controversy continued after the war, if not in the halls of high command, in the public eye. Holland Smith retired from the Marine Corps with his fourth star in May 1946, having served in the Corps for 41 years. He promptly wrote his memoirs, which were serialized in the Saturday Evening Post in 1948, and in book form in 1949 with the title Coral and Brass. In his memoirs, Holland Smith defended his decision to fire Ralph Smith and blasted the 27th Infantry Division for its perceived weaknesses. The 27th Infantry Division’s official historian, Captain Edmund G. Love, wrote a rebuttal for the Saturday Evening Post as well, and another one for the division’s history, published by the Infantry Journal. Love defended Ralph Smith and his GI buddies. The Marine history was written in 1966 by Henry I. Shaw, Jr., Bernard C. Nalty, and Edwin T. Turndbladh and titled Central Pacific Drive. After he was relieved of command of the 27th Infantry Division on Saipan, General Ralph Smith was transferred to the European Theater, where he served with distinction as a liaison officer to Free French commander General Charles de Gaulle. 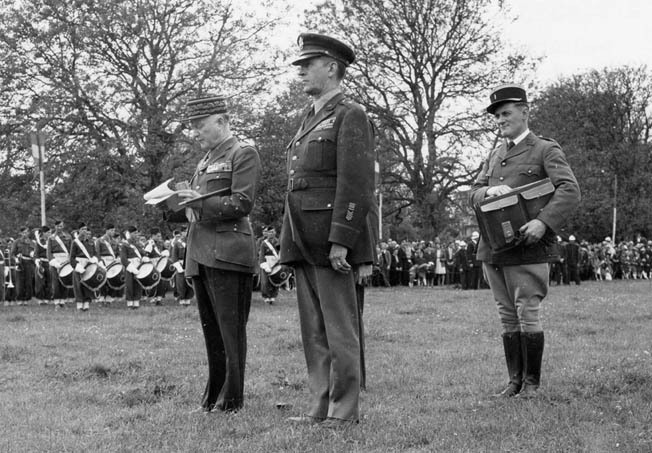 In this photo, Smith attends a 1946 ceremony in the village of Ste. Mere-Eglise, France, honoring soldiers of the 82nd Airborne Division, who parachuted into the area on D-Day. Ultimately, Ralph Smith probably had the last word. After retiring from the Corps, Holland Smith lived in La Jolla, California, pursuing his hobby of gardening until his death at age 84 in 1967. He is buried in Fort Rosecrans National Cemetery in San Diego. Ralph Smith, however, became Chief of Mission for CARE (Cooperation for Assistance and Relief Everywhere) in France, retiring from the Army in 1948. After that, he was a fellow at the Hoover Institution on War, Revolution, and Peace, in California, and lived until 1998, dying at the age of 104. At his death, he was the oldest surviving general officer in the U.S. Army and had outlasted all of his critics. Tags Admiral Chester A. Nimitz, Allies, Axis, Battle of Saipan, Charles de Gaulle, Ernest J. King, General Douglas MacArthur, General George C. Marshall, General Henry H. “Hap” Arnold, General Ralph Smith, Holland M. Smith, Pacific Theater, Raymond Ames Spruance, Richmond Kelly Turner, Robert Eichelberger, Robert Richardson, Saipan, Sanford Jarman, Simon Bolivar Buckner, U.S. Army, U.S. Army Air Corps, United States Marine Corps, Walter Krueger, William Randolph Hearst. Maybe both were right and wrong.There were many personality clashes. Each thought they were doing the right thing. War is full of mistakes which causes needless loss of lives. I enjoyed the article. But simple factual errors drive me crazy!! It was IMPOSSIBLE for Ralph Smith to graduate from the Army War College in Carlisle in 1935…..as it was still located in Washington Barracks? A minor matter…..sure. But…..if the author and editor got THIS wrong…..what else might be wrong? Fact check!